High performance MPEG Transport Stream Player, Recorder and Analyser supporting all Alitronika’s devices. Automatically obtains the bitrate from the PCR during Recordingand Playing. Accurate estimation of bitrate when there is none in the PCR. Unlimited numbers of play loops. Supports sub-loops, partial file play. Recoding file selectable by size by duration of recording. User selectable recording of up to 3 TS files in a loop-recording. Automatic correction of PCR/PTS/DTS and continuity counter. Integrated file information, (P)SI viewer. Allows Null packet insertion using hardware only. Allows PID filtering using hardware only. Support for Hardware Null packet and counter packet generation for testing without any load on the PC. Allows user to set TOT/TDT. Supports Time stamping using hardware only. Integrated Hex editor for viewing/ Editing TS files. Multiple application can be run simultaneously on the same PC for playing/recording of multiple Streams. Support unlimited number of LNB setting. 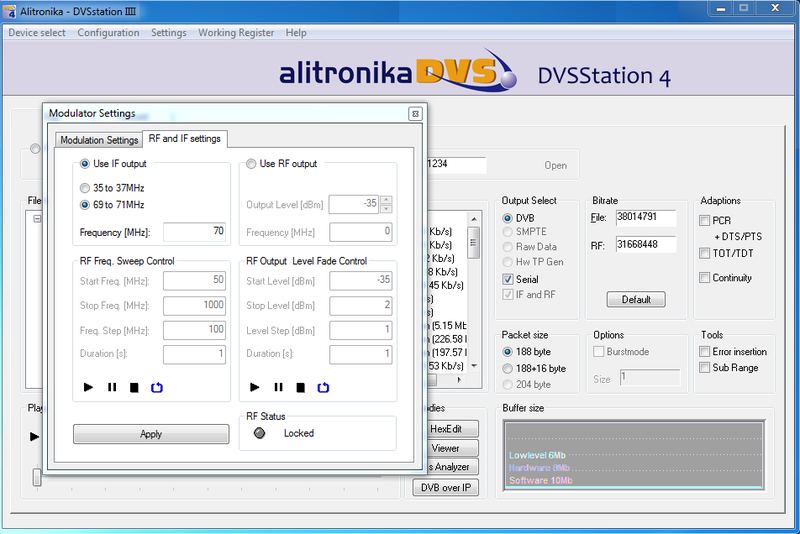 Support DVB-T/T2/H/S/S2/C/C2 and ATSC Modulator & Demodulator settings. Support RF Frequency Sweep and power level Fadding of modulator's RF output. Displays all operational registers of the hardware during play and record for diagnostics purposes. Displays hardware and software buffer usages during play and record operations. Allows selection of DVB-ASI, DVB-SPI, RAW data, Burst or continuous mode. Allows Playing & Recording of SMPTE Serial ( SDI ) or Parallel Signals. Integrated DVB to IP converter. Universal Interface for Digital Video or MPEG-II Transport Stream Recorder, Player. PC: Any PC that Windows XP, Vista and Win 7 can run on it. Hardware: Any Alitronika USB or PCI devices. PCI slot: One free slot for every PCI based board. USB port: For USB based devices USB2.0 port. Recommendations for problem free operation: In general 1Gb memory is needed, a moderate speed CPU is sufficient. The harddisk is the bottle neck so a fast one is important, two would give the best result with the operating system running on one and other applications on one.